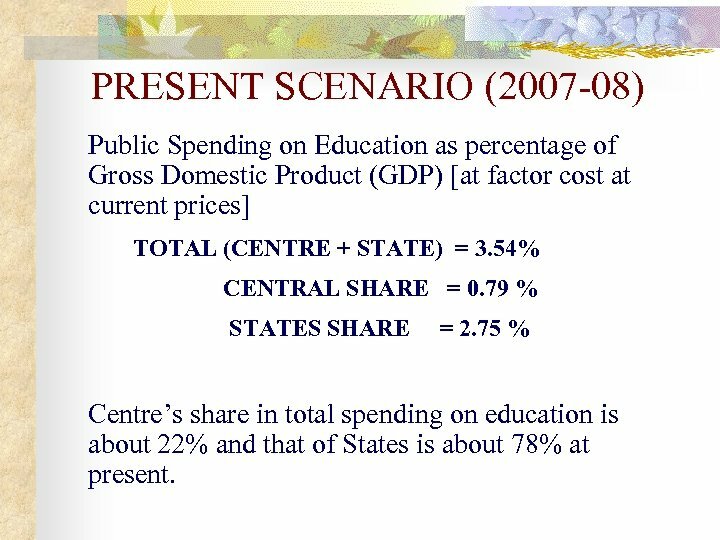 PRESENT SCENARIO (2007 -08) Public Spending on Education as percentage of Gross Domestic Product (GDP) [at factor cost at current prices] TOTAL (CENTRE + STATE) = 3. 54% CENTRAL SHARE = 0. 79 % STATES SHARE = 2. 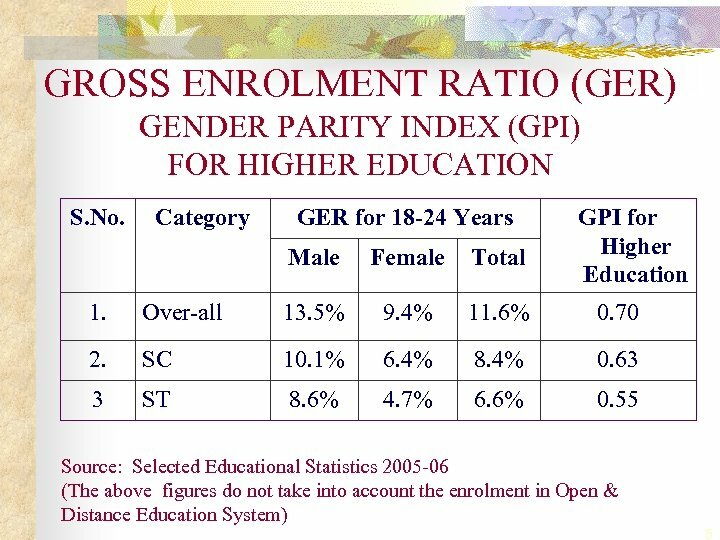 75 % Centre’s share in total spending on education is about 22% and that of States is about 78% at present. 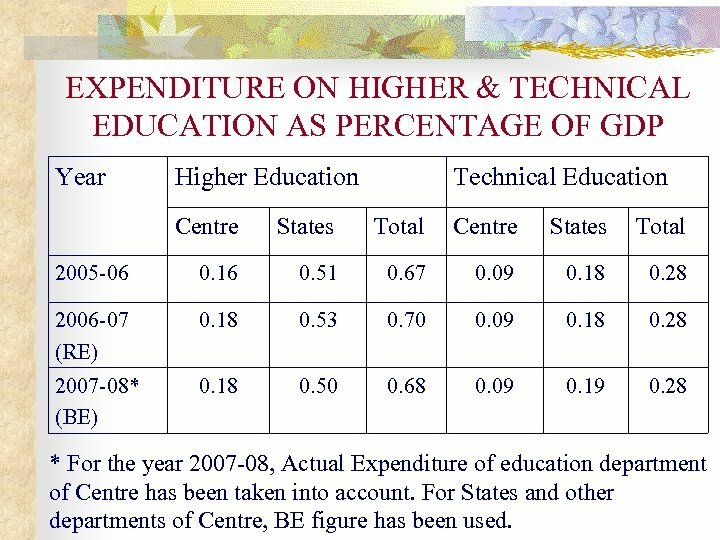 EXPENDITURE ON HIGHER & TECHNICAL EDUCATION AS PERCENTAGE OF GDP Year Higher Education Technical Education Centre States Total 2005 -06 0. 16 0. 51 0. 67 0. 09 0. 18 0. 28 2006 -07 (RE) 0. 18 0. 53 0. 70 0. 09 0. 18 0. 28 2007 -08* (BE) 0. 18 0. 50 0. 68 0. 09 0. 19 0. 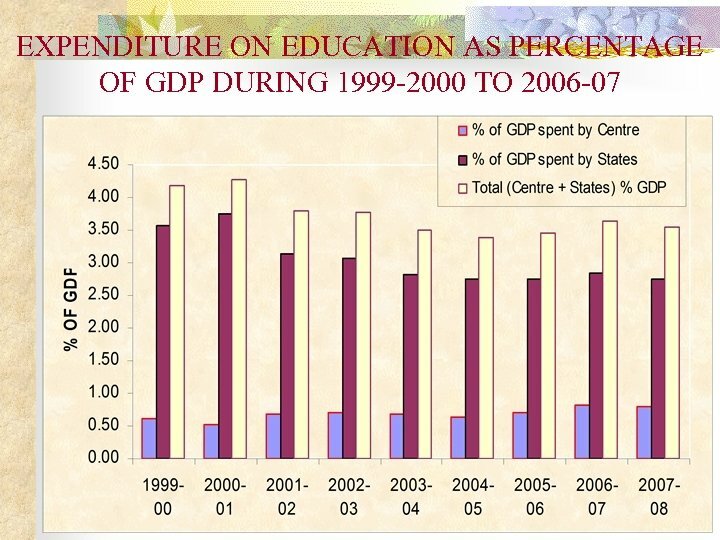 28 * For the year 2007 -08, Actual Expenditure of education department of Centre has been taken into account. 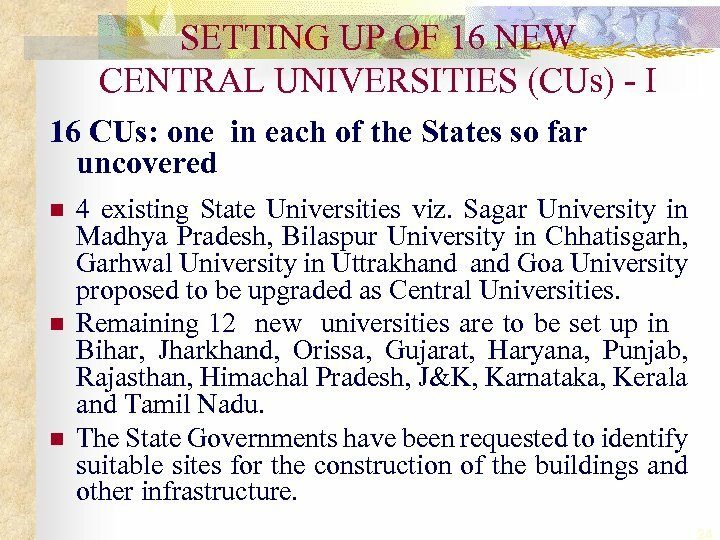 For States and other departments of Centre, BE figure has been used. 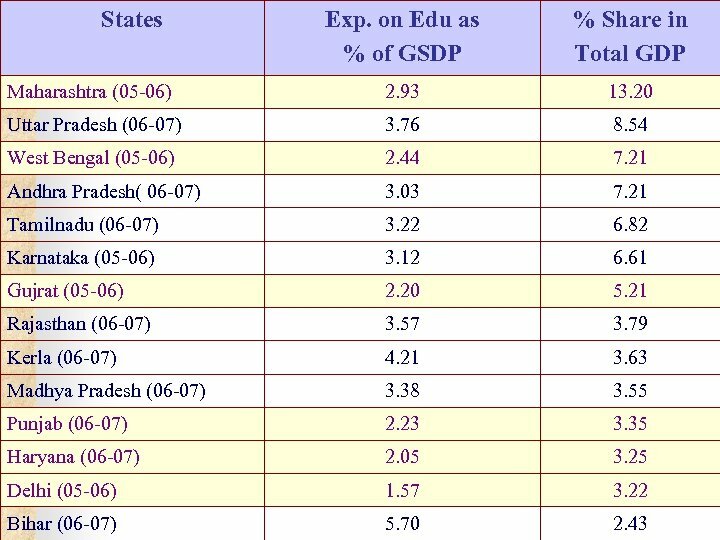 STATES’ GSDP AND THEIR EXPENDITURE ON EDUCATION n States of Maharashtra, UP, WB, Andhra Pradesh, Tamilnadu, Karnataka, Gujrat, Rajasthan, Kerala, MP, Punjab, Haryana, Delhi and Bihar contribute about 78% of the total GDP of the country. 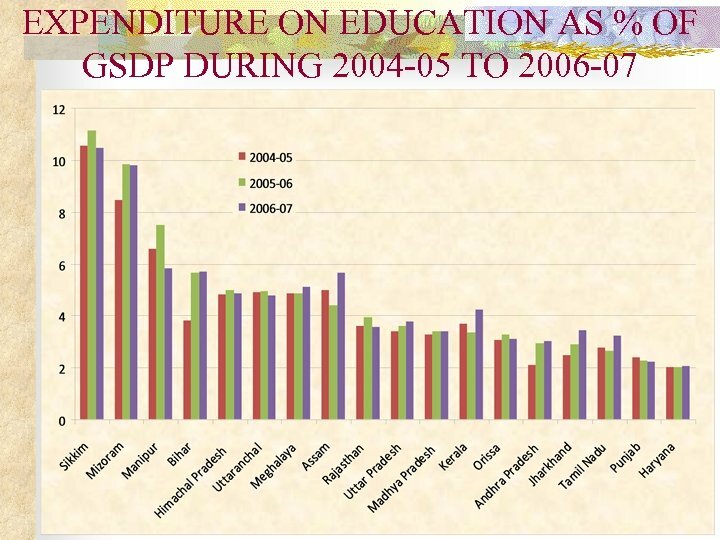 n But most of these states expend a very little proportion of their GSDP on education. 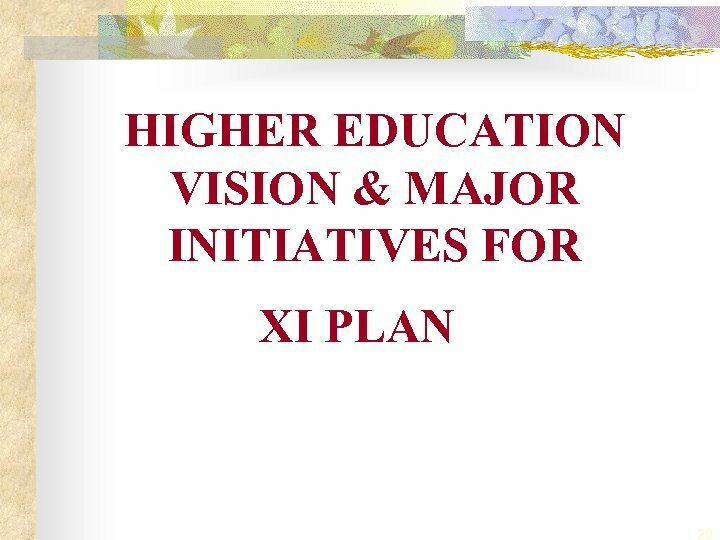 XI PLAN AND 6% GDP COMMITMENT n n n Substantial increase has been made in Central Plan Outlay for education by allocating Rs. 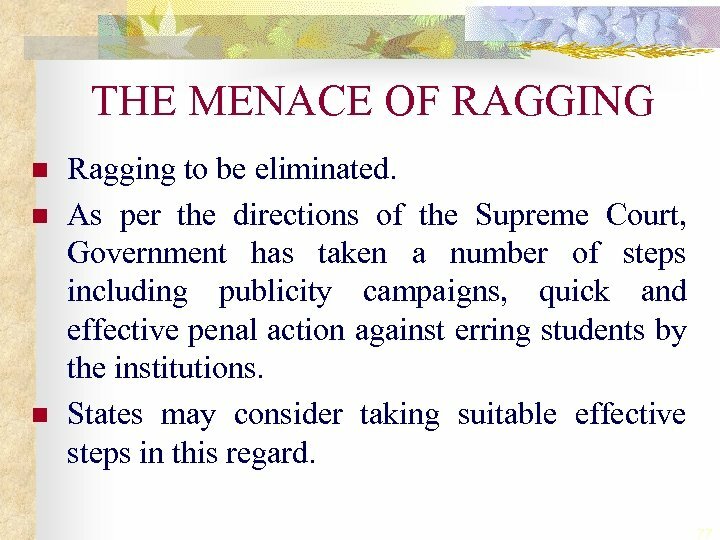 2, 69, 873 crore ( Rs. 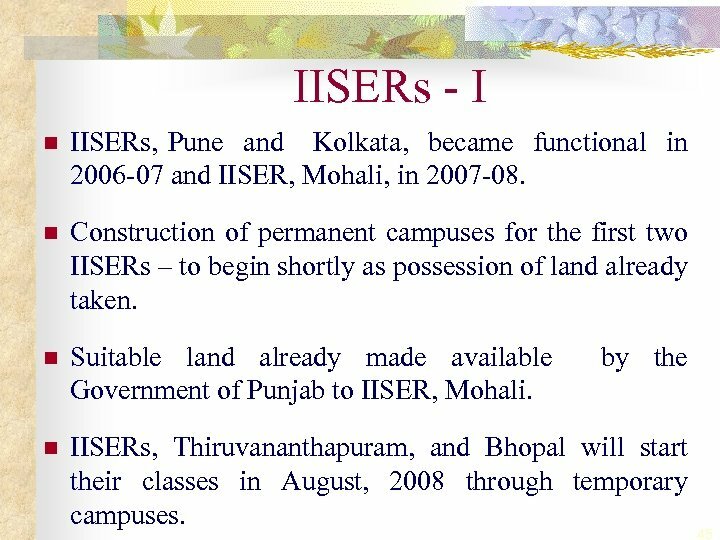 1, 84, 930 crore for SE&L and Rs. 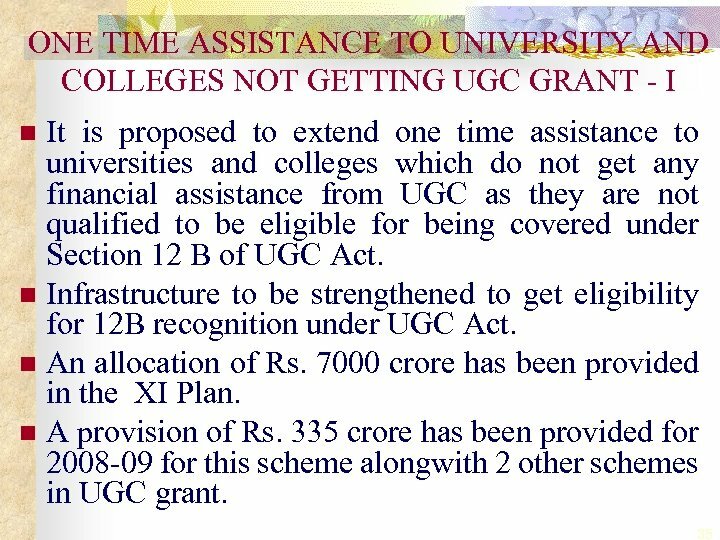 84, 943 crore for HE) during XI Plan. 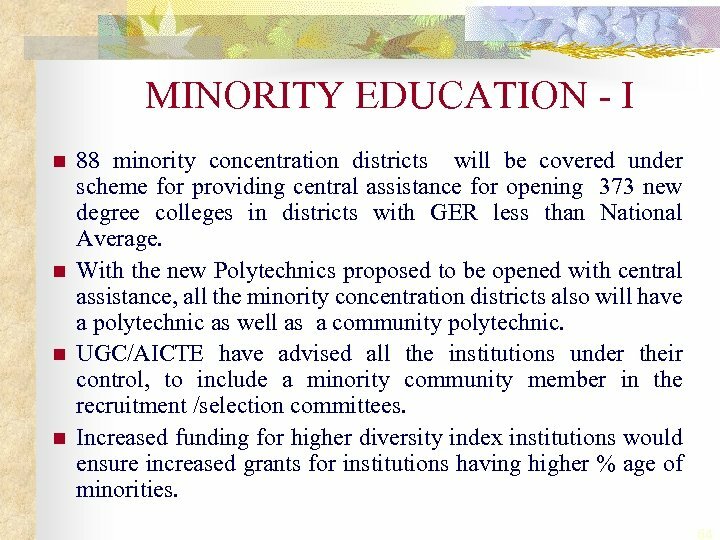 With this increased allocation, the expenditure on education by centre (excluding spending on education by other Departments) would reach a level of about 1. 2% of GDP by the end of XI Plan. 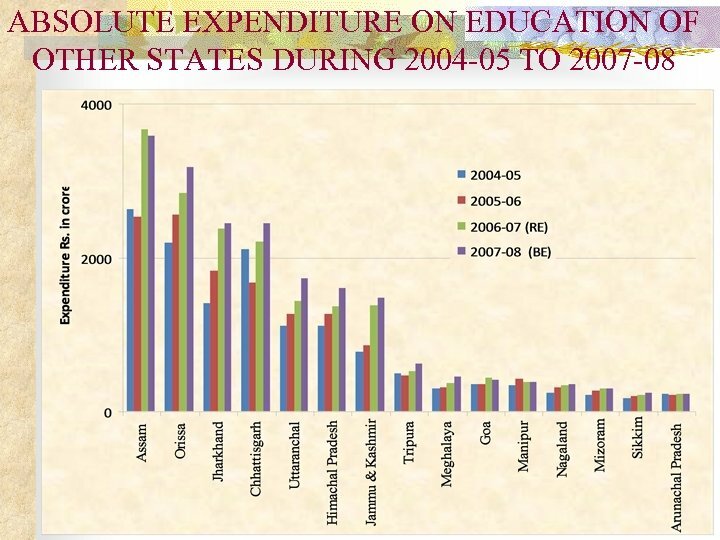 After including 25% (as prevailing today) share by other Departments, the total expenditure on education by Centre will reflect about 1. 6% of GDP by the end of XI Plan. 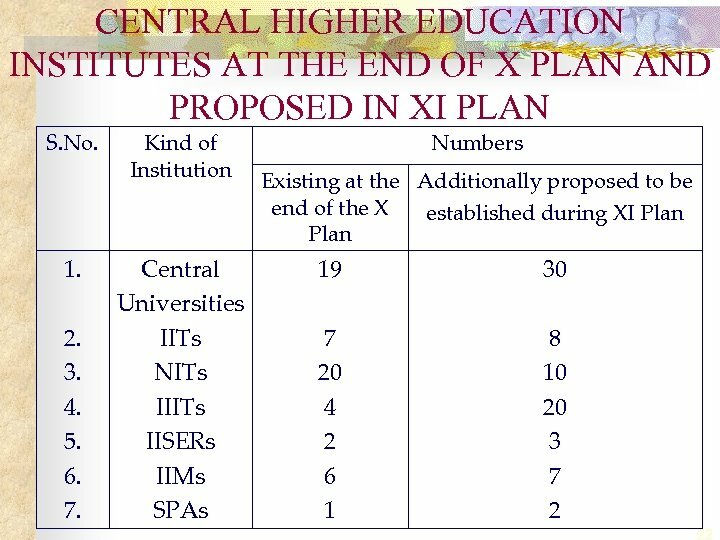 XI PLAN AND 6% GDP COMMITMENT n n The present rate of sharing of the total public expenditure on education between centre and state is 22: 78. With increased Central plan allocation during XI Plan, this sharing would become 25: 75. 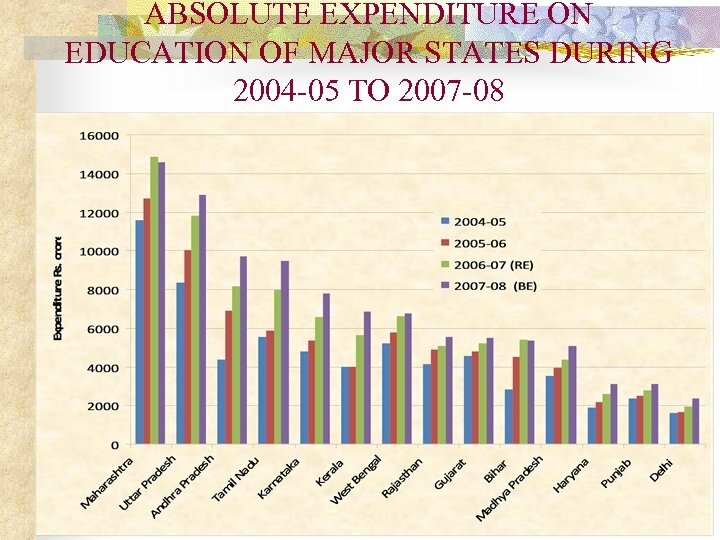 Accordingly the State share of expenditure would reach about 4. 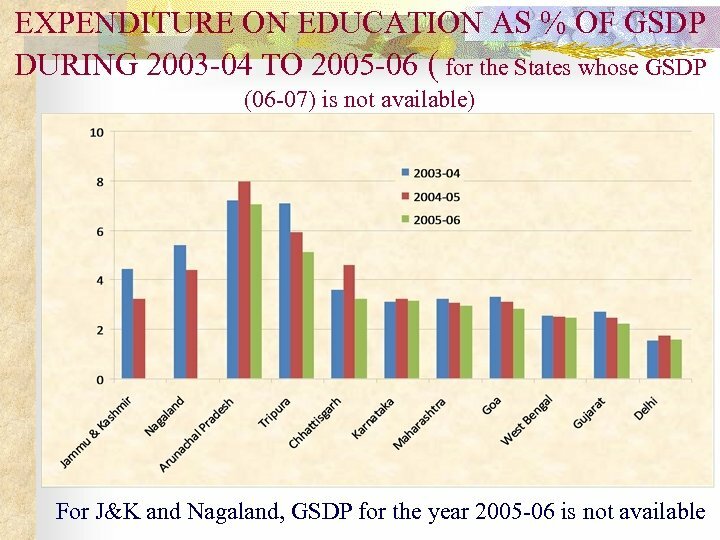 5% of GDP if the States increase their allocation on education by 2. 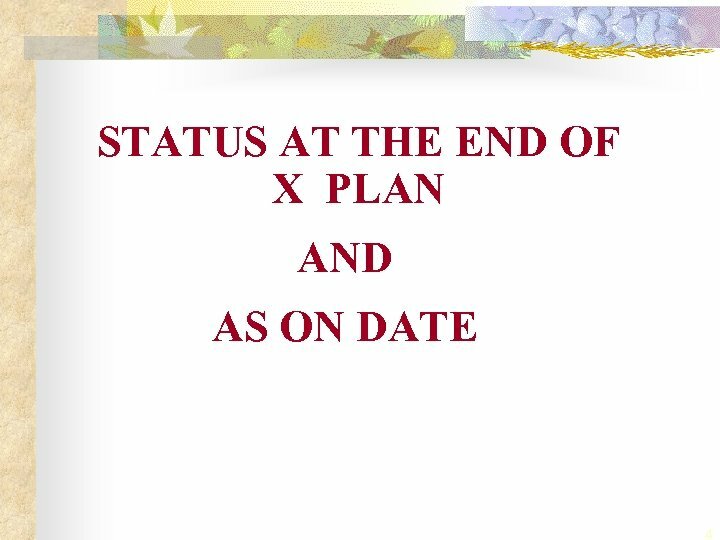 5 times of X Plan. 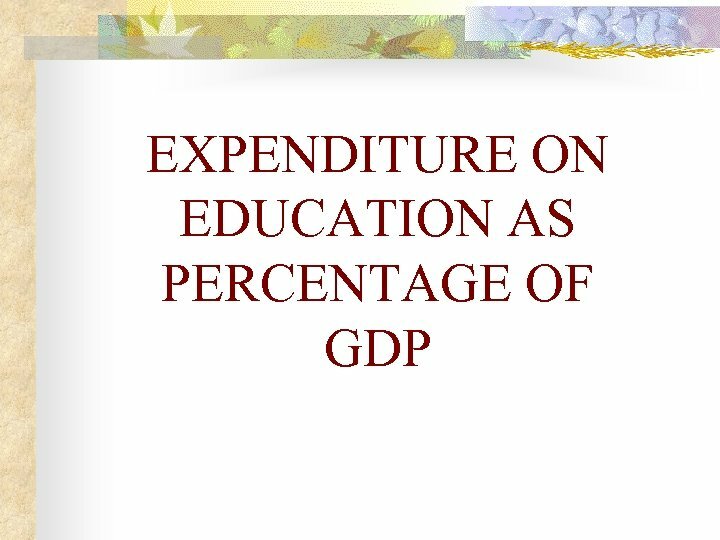 Total Public Expenditure on Education is thus, estimated to be 6. 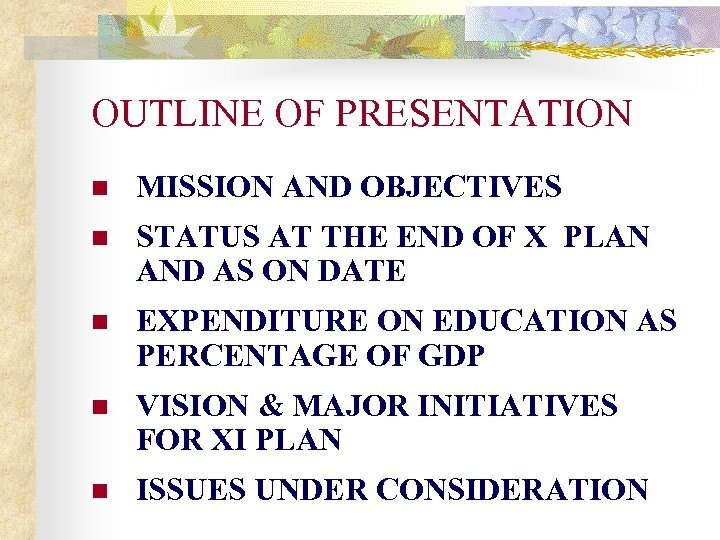 1% of GDP towards the end of XI Plan (on the assumption of GDP growing at 9% per year). 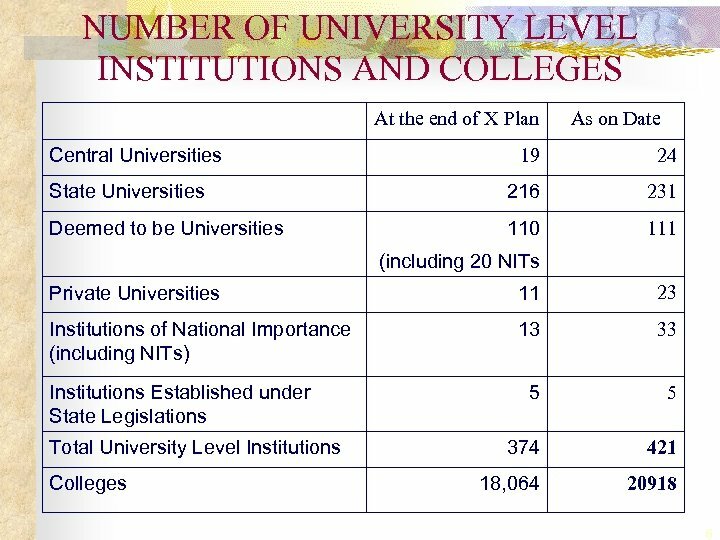 27% OBC RESERVATIONS IN CENTRAL EDUCATIONAL INSTITUTIONS (CEIs) n n OBC Reservations implemented in all CEIs covered by the Act in a phased manner from the current academic session. 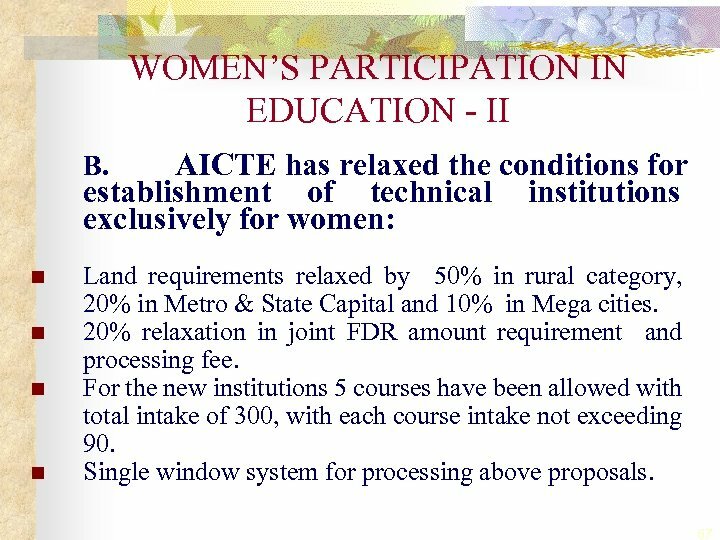 Proposed to amend the CEI Act to provide for 3 years phasing, starting from year 2008. Rs. 2522 crore provided during the current year for expansion of capacity. 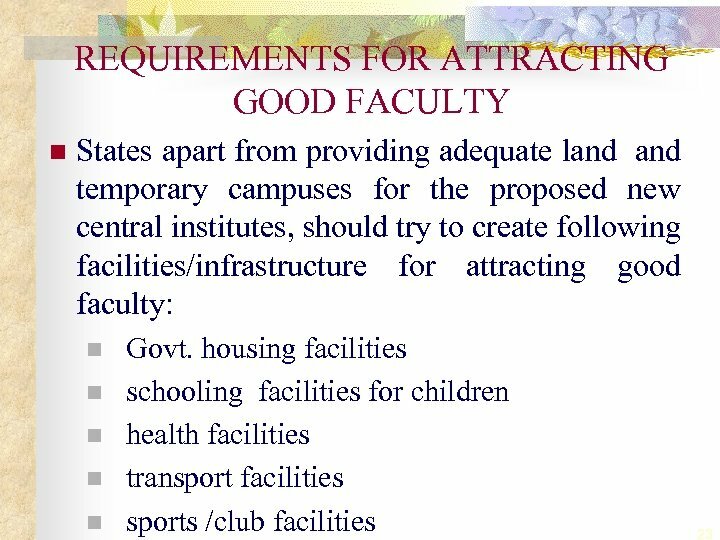 States may consider enacting similar legislation to provide reservations in admission to OBC students. 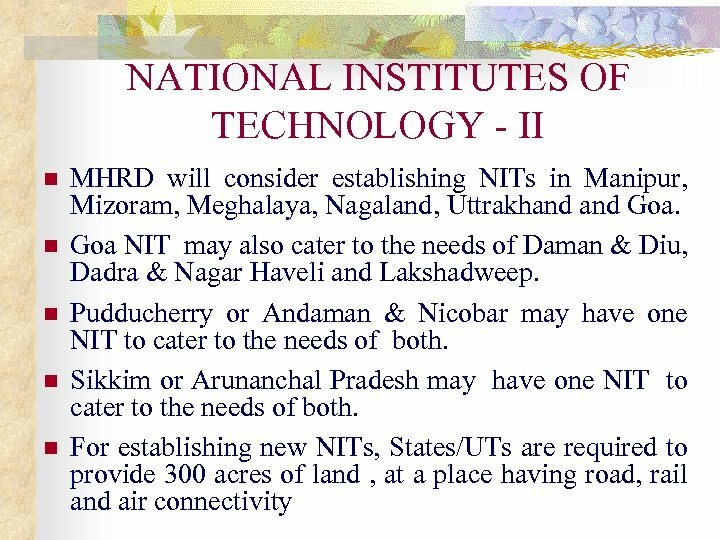 NATIONAL INSTITUTES OF TECHNOLOGY - I n There are 20 National Institutes of Technology (NITs), fully funded by the Central Government. 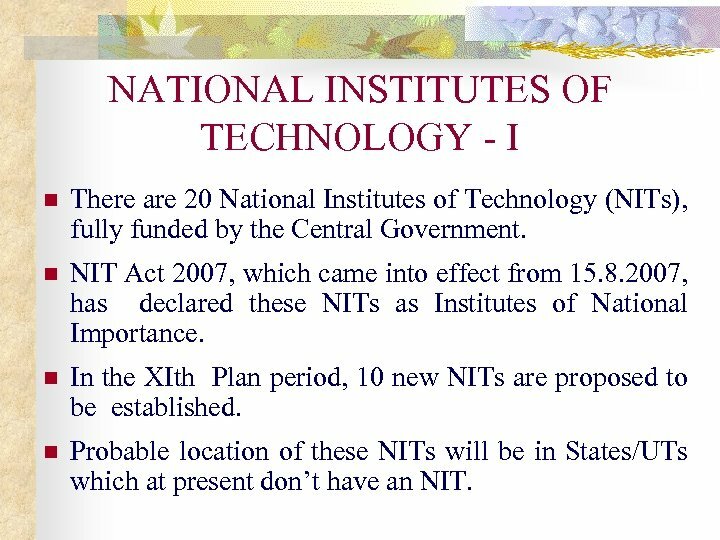 n NIT Act 2007, which came into effect from 15. 8. 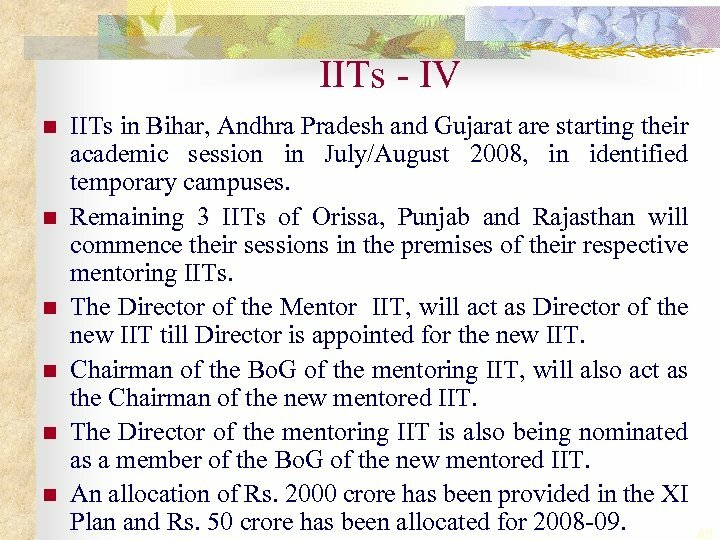 2007, has declared these NITs as Institutes of National Importance. 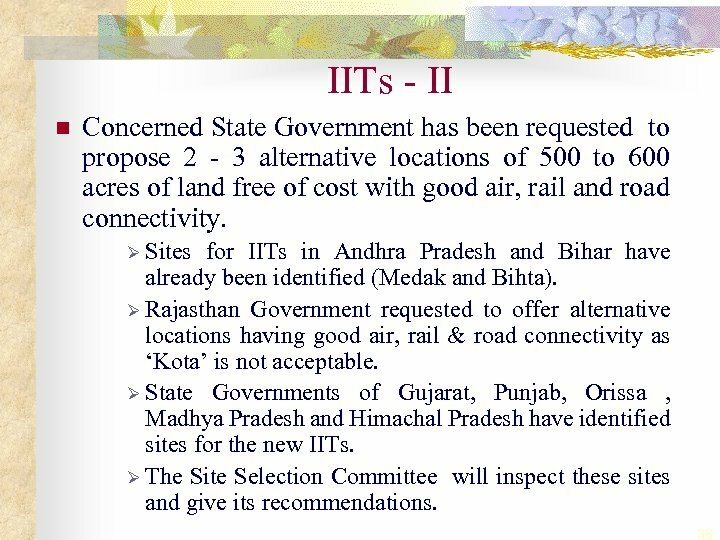 n In the XIth Plan period, 10 new NITs are proposed to be established. 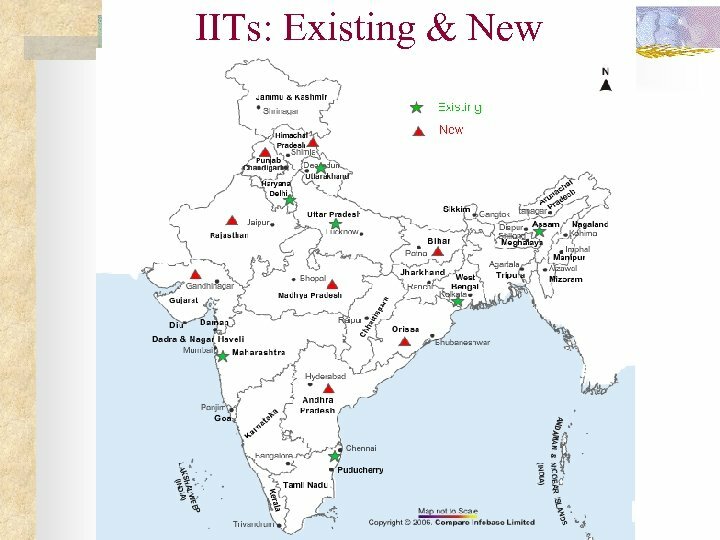 n Probable location of these NITs will be in States/UTs which at present don’t have an NIT. 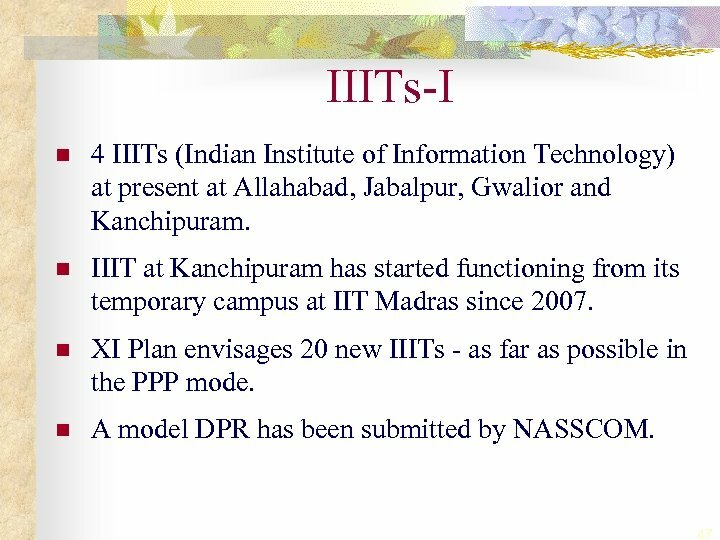 TECHNICAL EDUCATION QUALITY IMPROVEMENT PROGRAMME (TEQIP) PHASE II n n n On successful near completion of TEQIP Phase I of Rs. 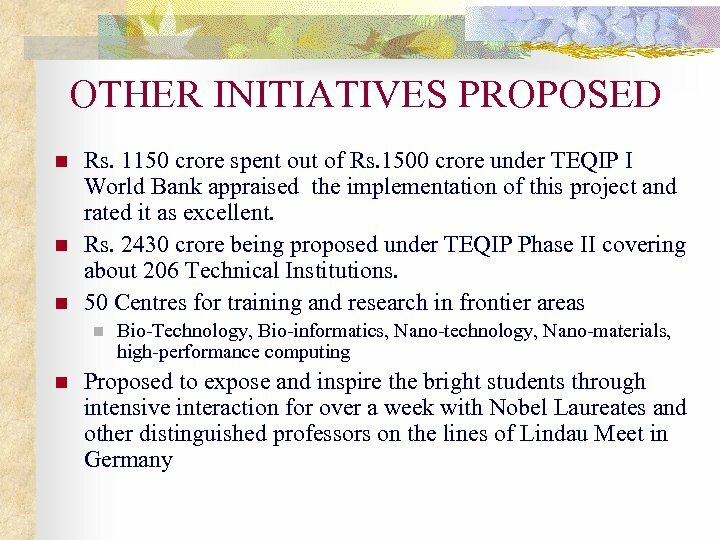 1500 crore, TEQIP Phase II proposed at a total outlay of Rs. 2430 crore. 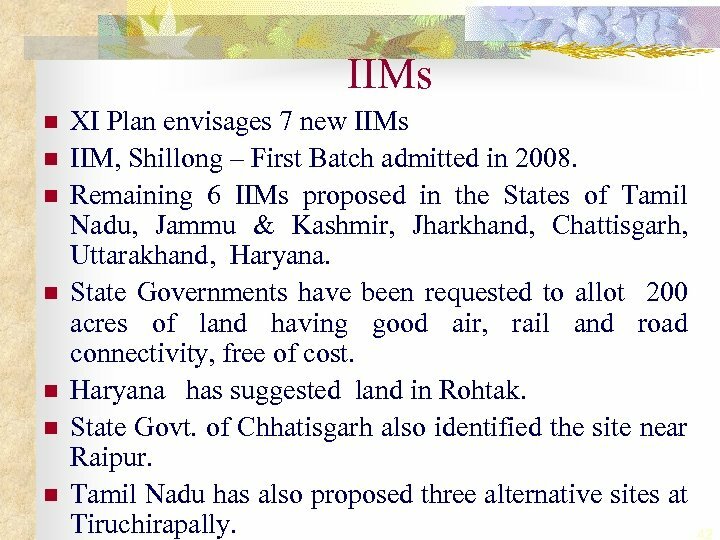 World Bank, Central Government and State Governments to contribute Rs. 1400 crore, Rs. 500, and Rs. 530 crore, respectively. 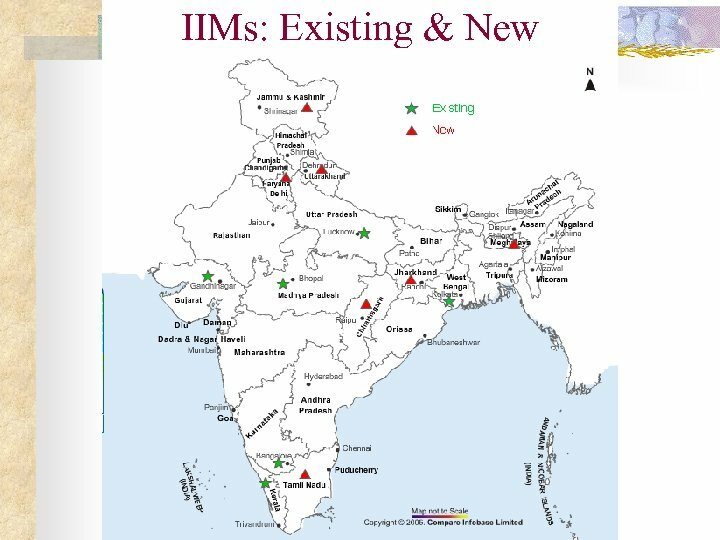 Lead institutions (60) / networking institutions (146) to get Rs. 15 crore and Rs. 10 crore, respectively. 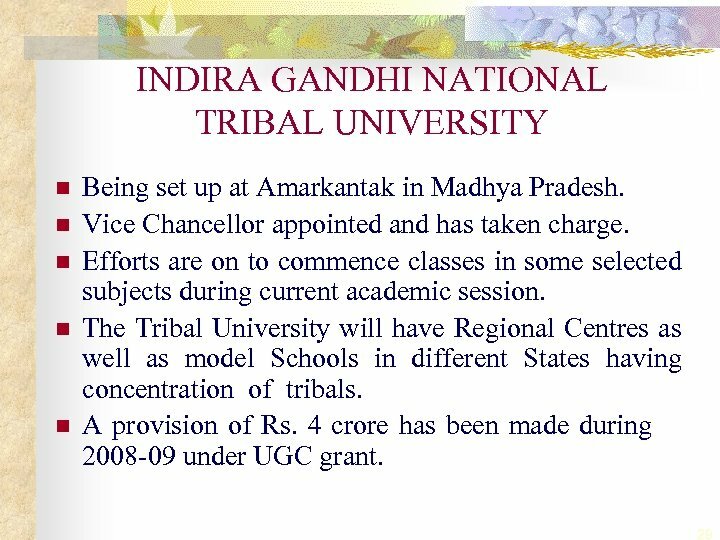 Selection of institutions / norms will be decided in consultation with stakeholders and World Bank. 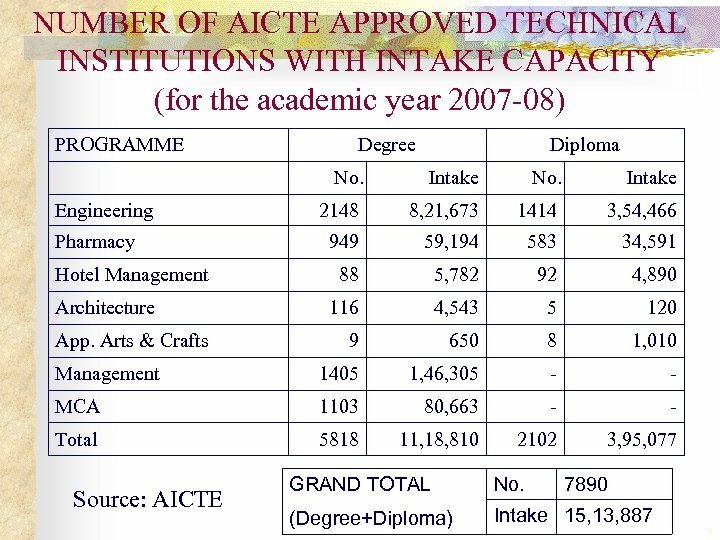 Focus on Capacity Building of Staff and Faculty (18%), Research Fellowships (18%) and Research Infrastructure Development and equipment (64%). 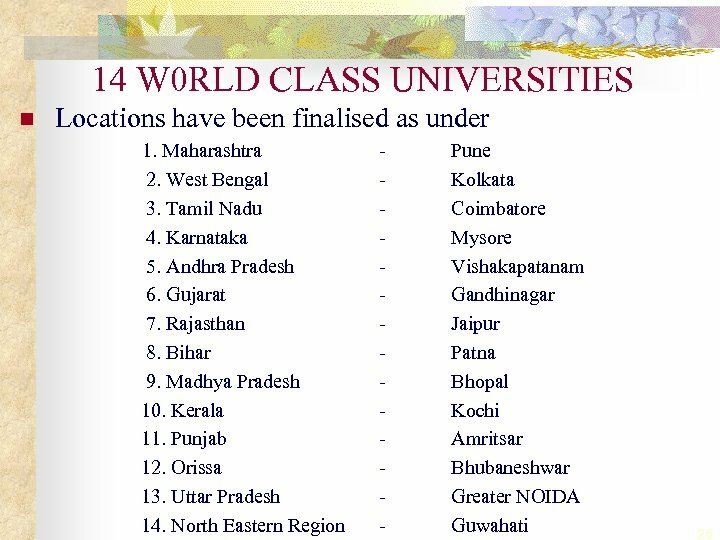 Only States willing to accept educational reforms will be eligible for World Bank Aid. 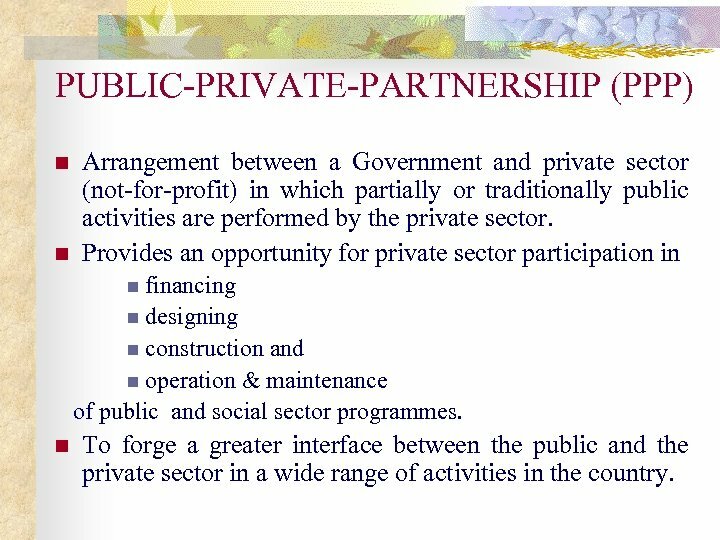 PUBLIC-PRIVATE-PARTNERSHIP (PPP) n n Arrangement between a Government and private sector (not-for-profit) in which partially or traditionally public activities are performed by the private sector. 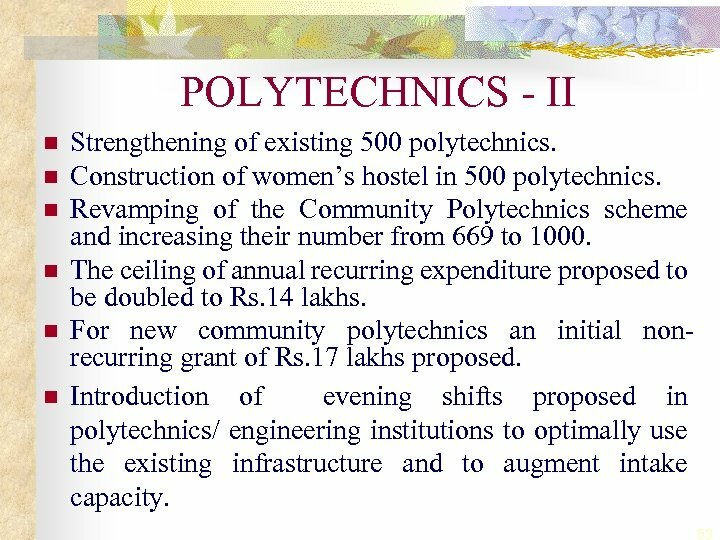 Provides an opportunity for private sector participation in n financing n designing n construction and n operation & maintenance of public and social sector programmes. n To forge a greater interface between the public and the private sector in a wide range of activities in the country. 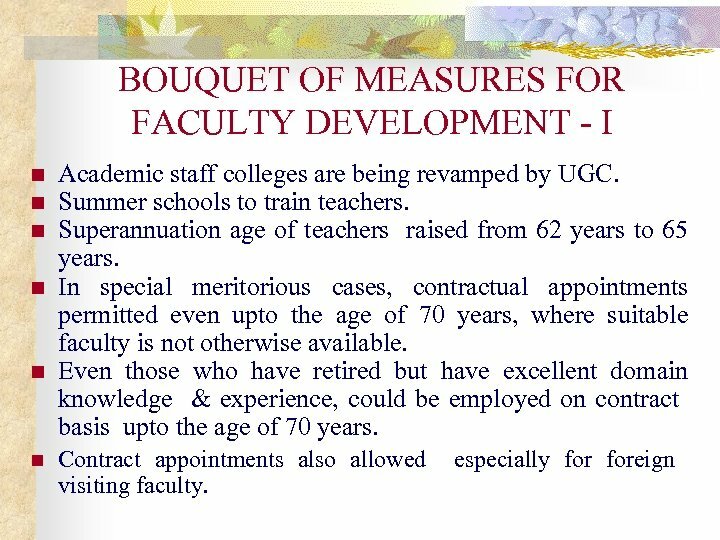 BOUQUET OF MEASURES FOR FACULTY DEVELOPMENT - II n n n Adjunct/Guest Faculty being employed to meet the shortfall in faculty. 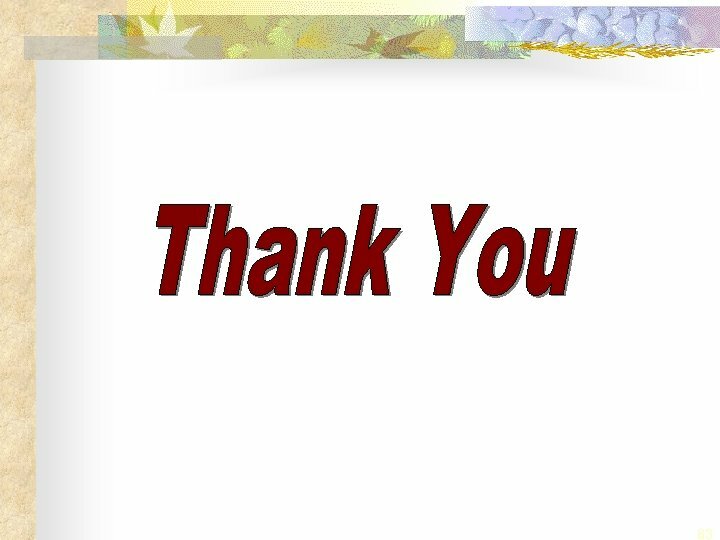 For taking care of immediate shortage of faculty, Ph. Ds and M. Phils are being allowed to teach at Post Graduate and Under Graduate levels respectively without NET qualifications. Students doing Ph. 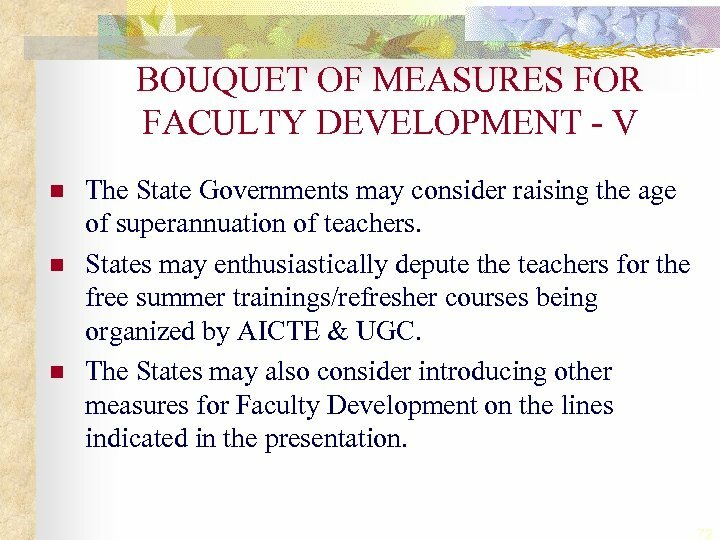 Ds also to be used to share the load of the faculty in tutorials and laboratory demonstrations etc. 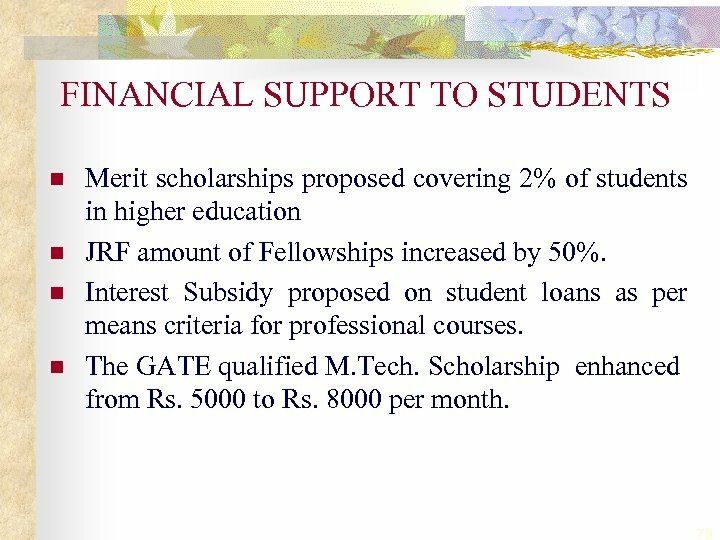 Consultancy charges allowed to be shared by the faculty. 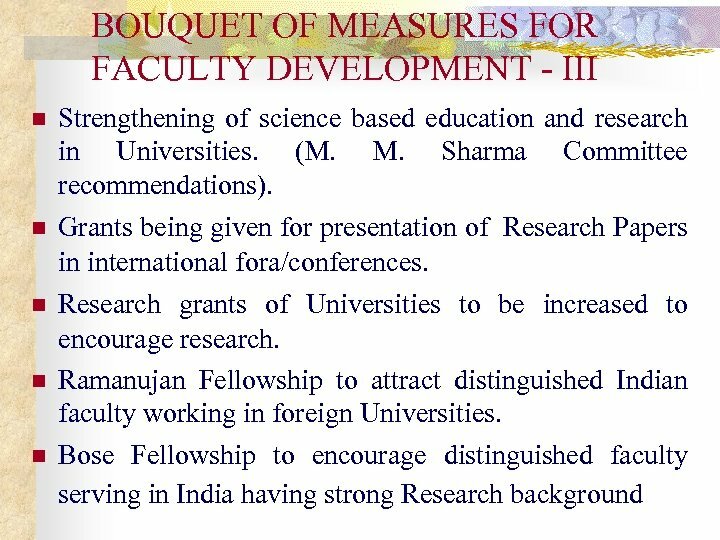 Rates of Junior and Senior Research Fellowships increased by about 50%. 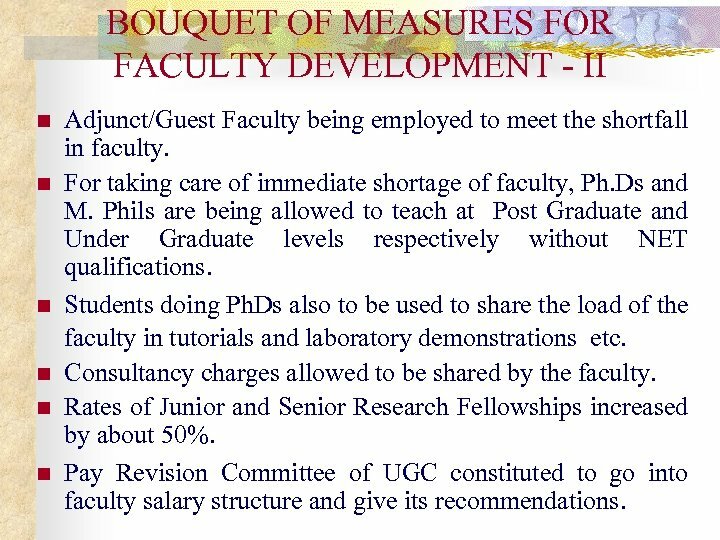 Pay Revision Committee of UGC constituted to go into faculty salary structure and give its recommendations. 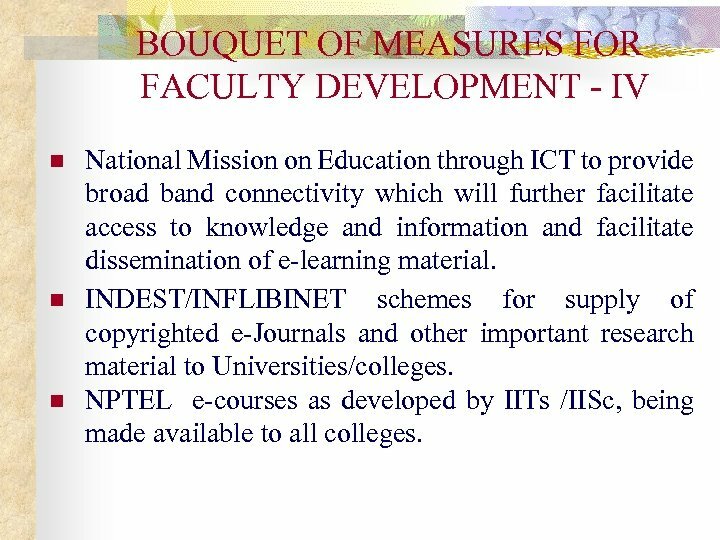 BOUQUET OF MEASURES FOR FACULTY DEVELOPMENT - IV n n n National Mission on Education through ICT to provide broad band connectivity which will further facilitate access to knowledge and information and facilitate dissemination of e-learning material. 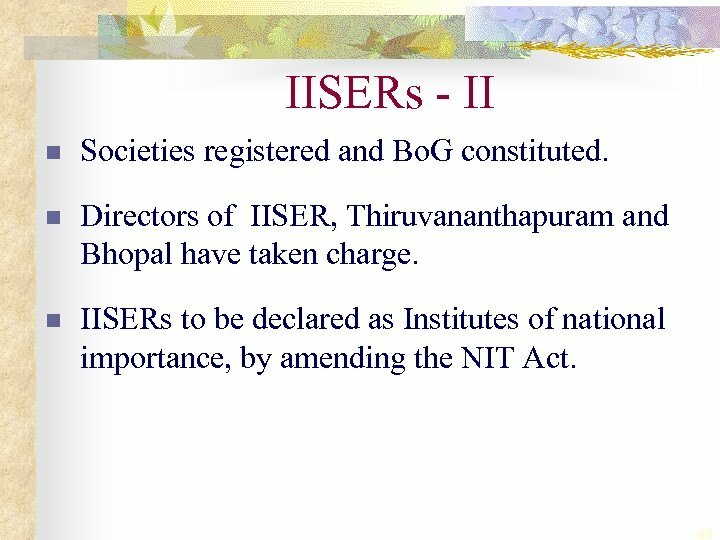 INDEST/INFLIBINET schemes for supply of copyrighted e-Journals and other important research material to Universities/colleges. 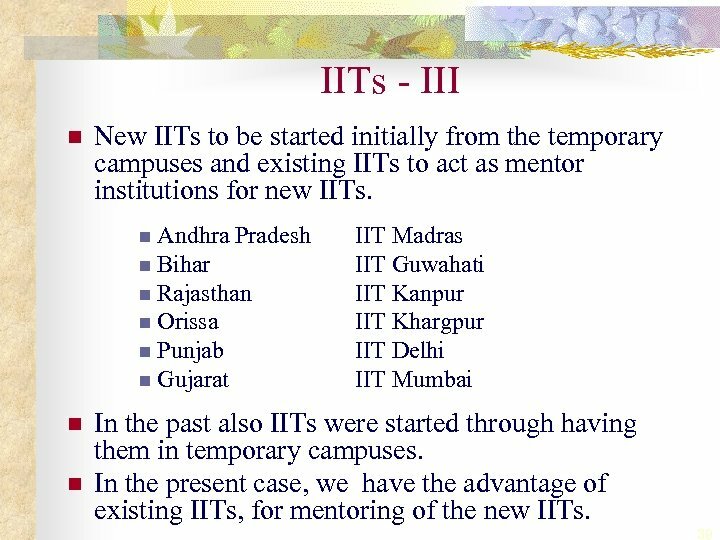 NPTEL e-courses as developed by IITs /IISc, being made available to all colleges. 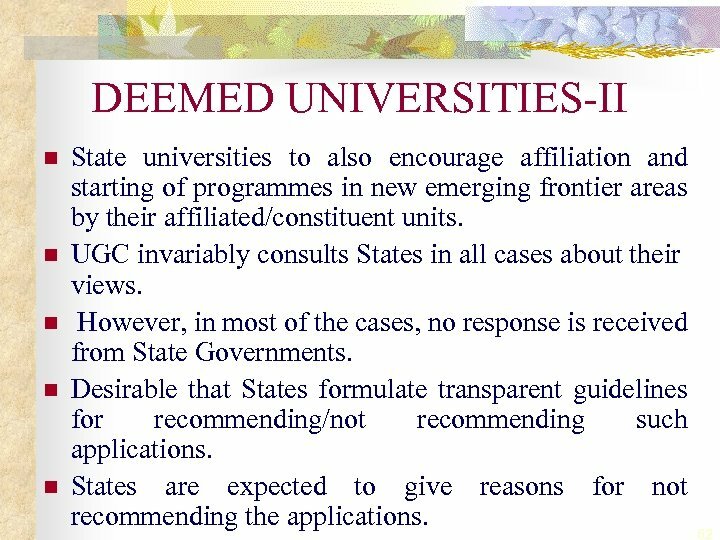 QUALITY: PROPOSED REFORMS - II n UGC has advised all Universities on 5. 2. 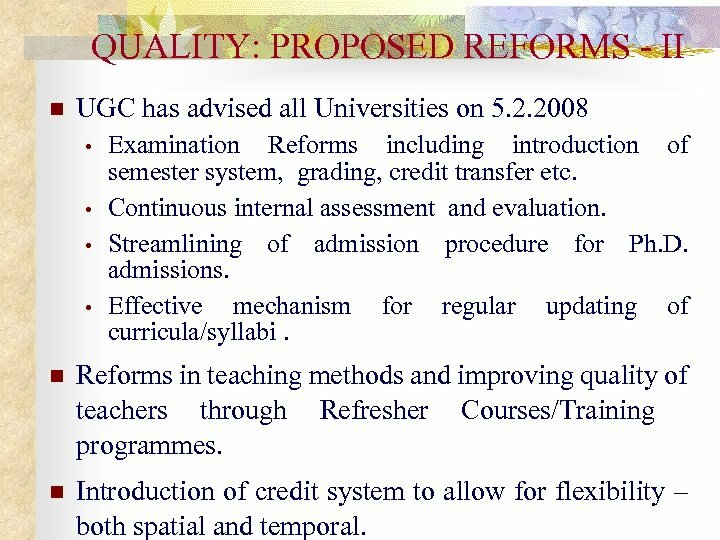 2008 • • Examination Reforms including introduction of semester system, grading, credit transfer etc. Continuous internal assessment and evaluation. 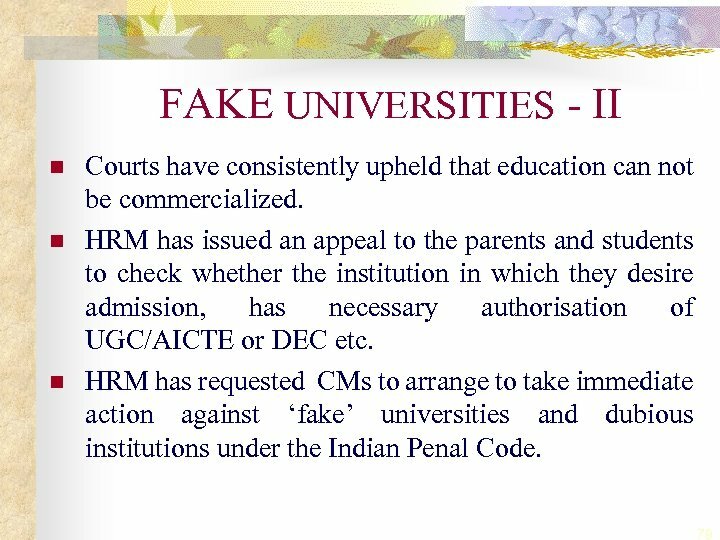 Streamlining of admission procedure for Ph. D. admissions. 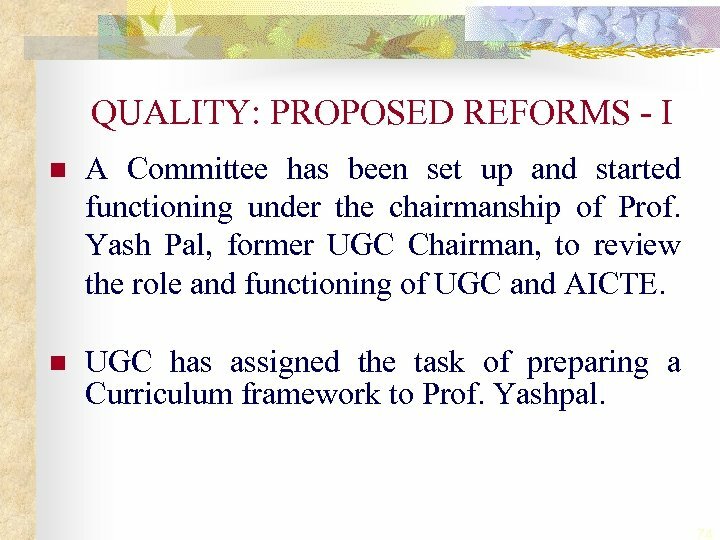 Effective mechanism for regular updating of curricula/syllabi. 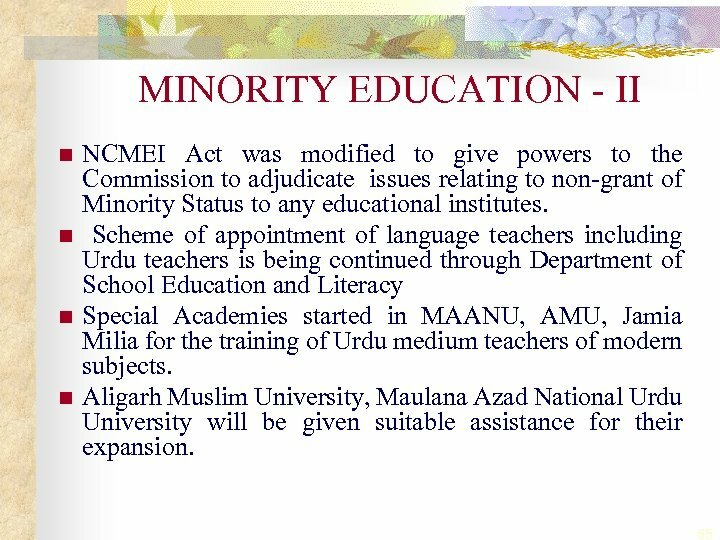 n Reforms in teaching methods and improving quality of teachers through Refresher Courses/Training programmes. 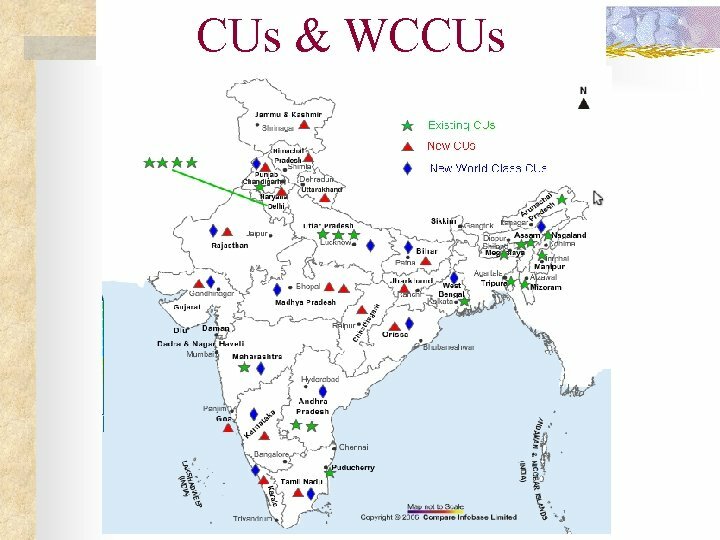 n Introduction of credit system to allow for flexibility – both spatial and temporal. 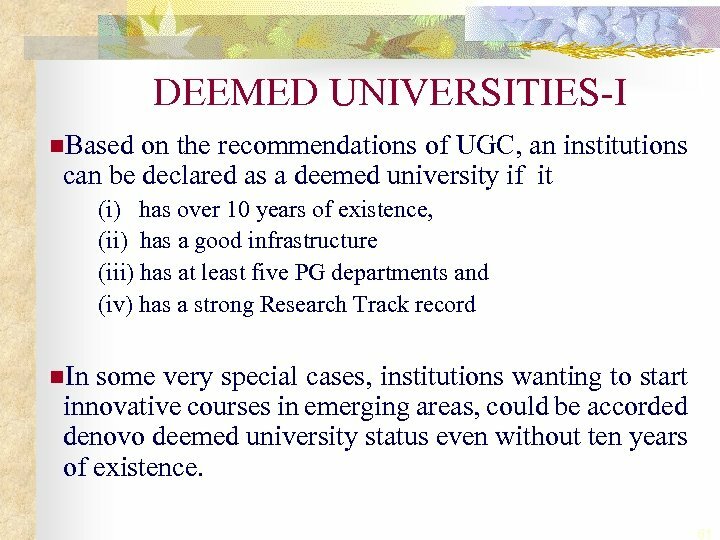 QUALITY: PROPOSED REFORMS - III n n Expansion of Research Programmes/Projects (some portion of development assistance of UGC is proposed to earmark specifically for research) through funded research. 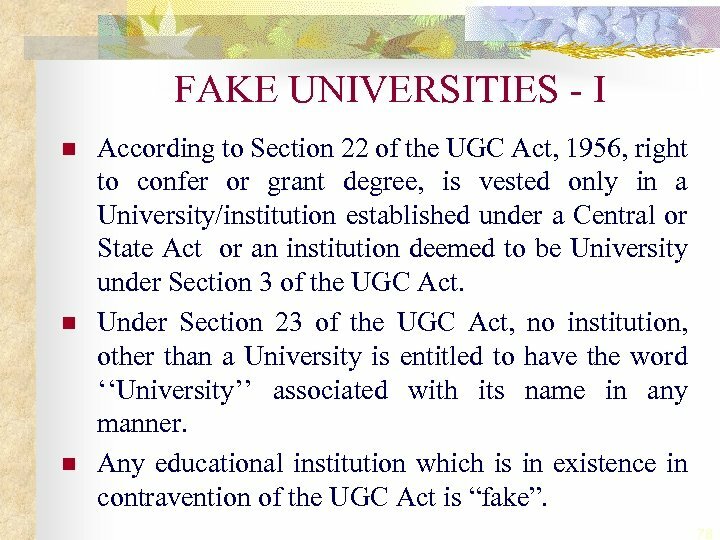 Introduction of mandatory accreditation n for institutions aspiring for UGC grant. 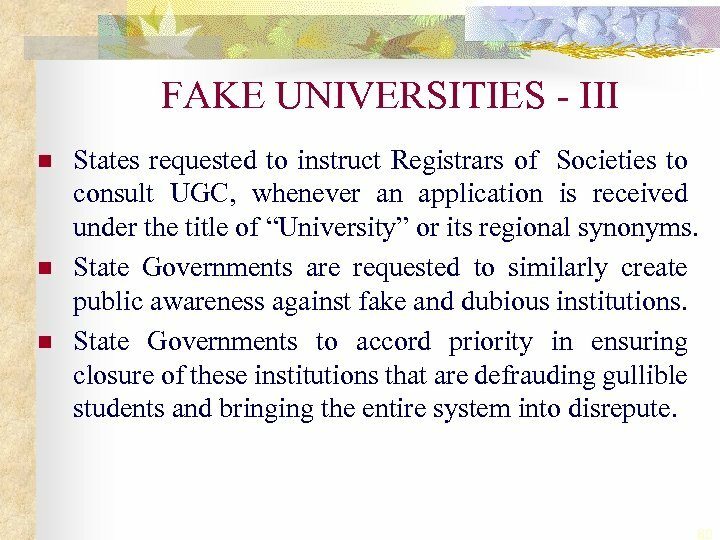 n for institutions seeking public financial assistance/ deemed university status. 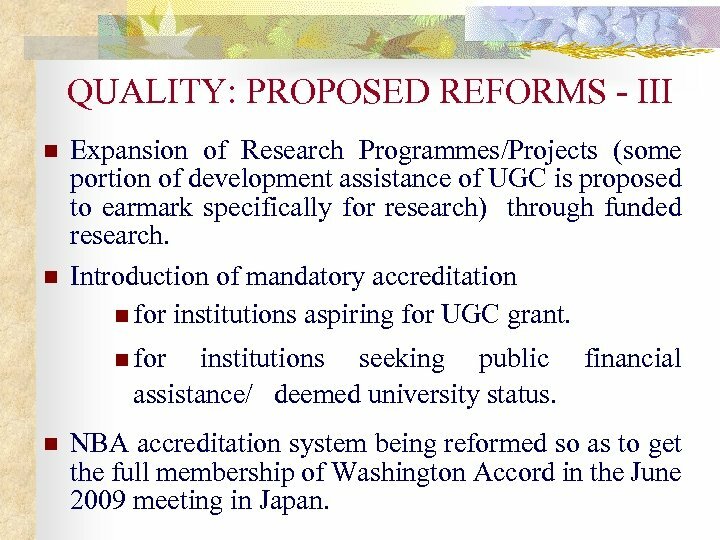 n NBA accreditation system being reformed so as to get the full membership of Washington Accord in the June 2009 meeting in Japan. 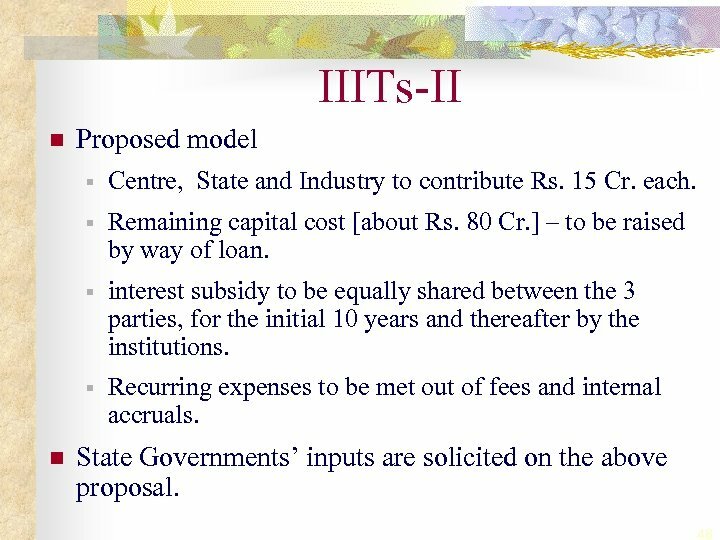 ISSUES UNDER CONSIDERATION - II n n n Increasing the expenditure on education by states with a view to increase the share of the State Governments in achieving the target of expenditure on education as 6% of GDP. 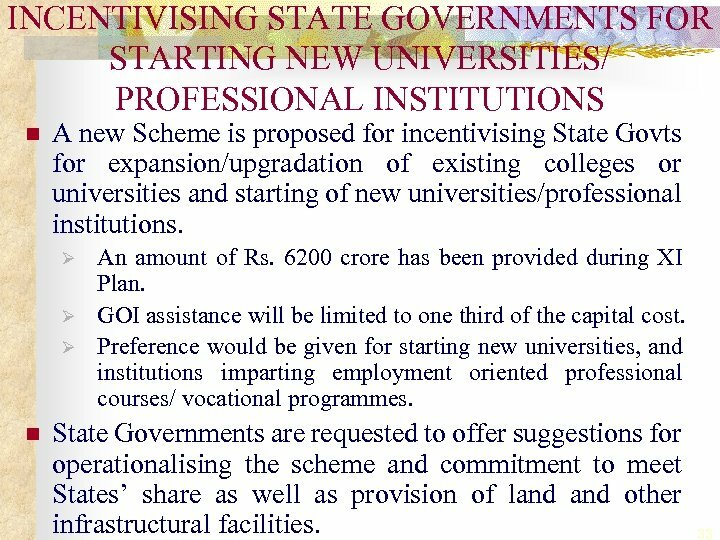 States to contribute Rs. 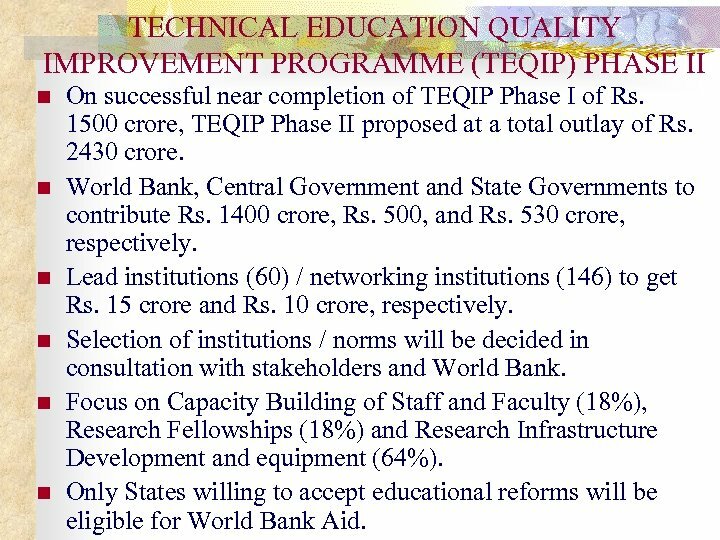 530 crore and agree for the Education Reforms to be eligible for World Bank’s TEQUIP II loan of Rs. 1400 crore. 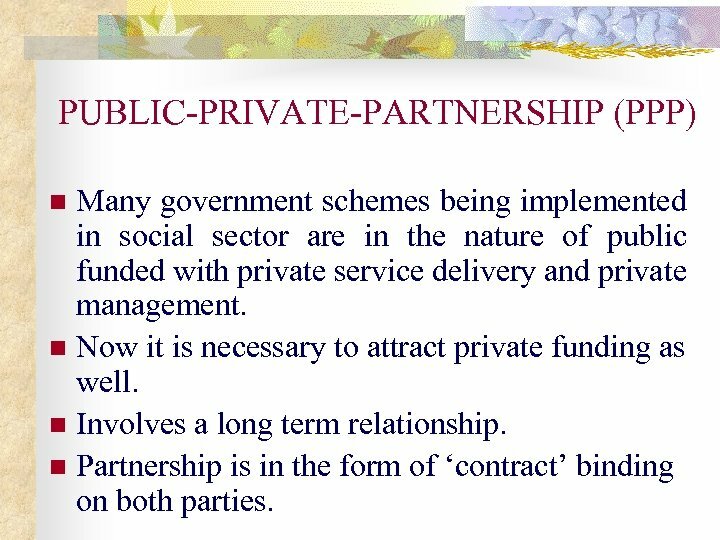 Modalities for public-private partnership. 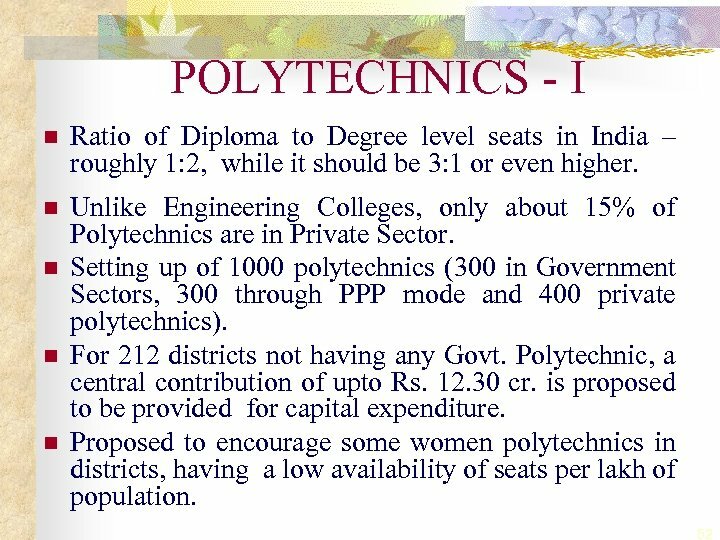 Timely supply of Statistical Data in respect of Higher and Technical Education. 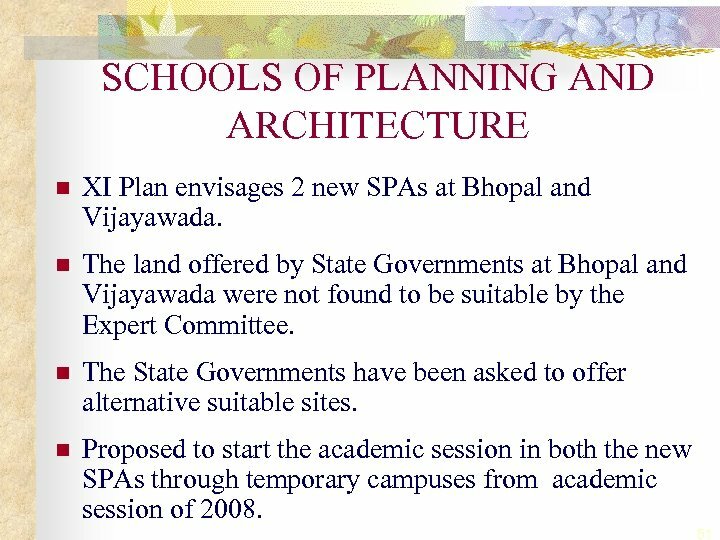 Advance preparation for implementing new schemes.